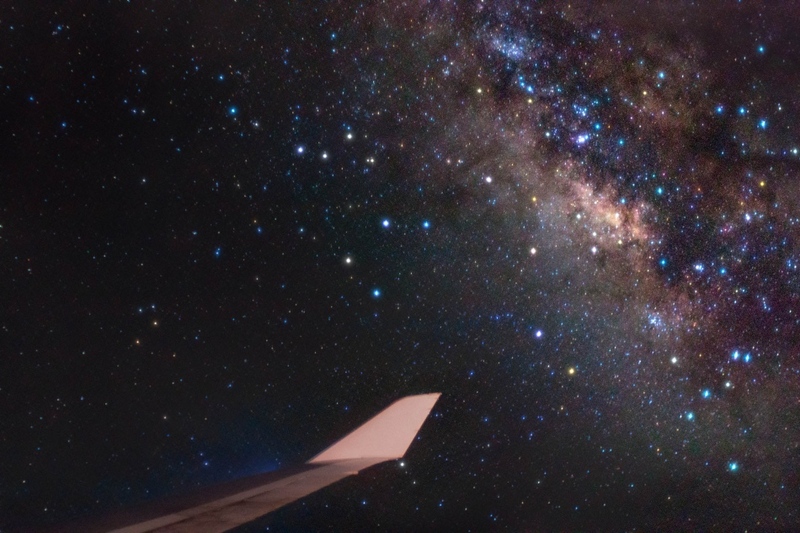 Explanation: Bright stars of Sagittarius and the centre of our Milky Way Galaxy lie just off the wing of a Boeing 747 in this astronomical travel photo. The stratospheric scene was captured earlier this month during a flight from New York to London, 11,0000 metres above the Atlantic Ocean. Of course the sky was clear and dark at that altitude, ideal conditions for astronomical imaging. But there were challenges to overcome while looking out a passenger window of the aircraft moving at nearly 1,000 kilometres per hour (600 mph). Over 90 exposures of 30 seconds or less were attempted with a fast lens and sensitive camera setting, using a small, flexible tripod and a blanket to block reflections of interior lighting. In the end, one 10 second long exposure resulted in this steady and colourful example of airborne astronomy.